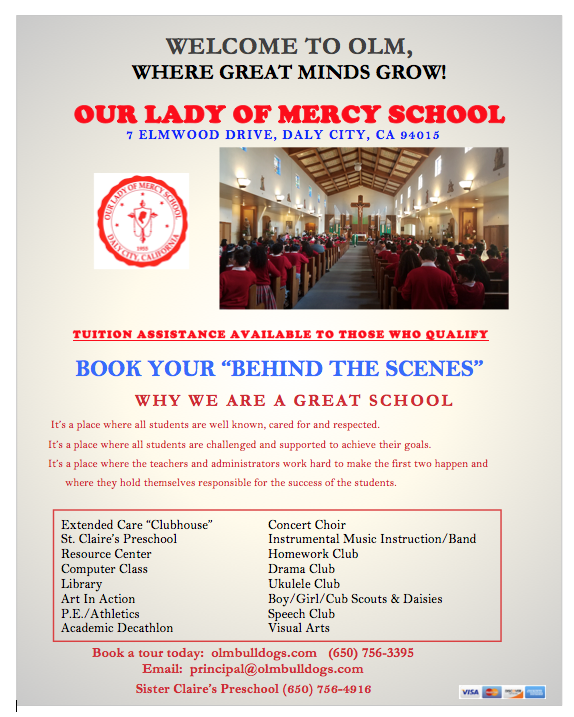 The annual cost (tuition) for attending Our Lady of Mercy Catholic School is set on a Family Plan Tuition Table based on the number of children in the family attending school, Grades K-8. Tuition rates are derived from the school's operating costs and the number os students seeking enrollment. The family's annual tuition supports approximately 80% of the true cost of each student's education at Our Lady of Mercy Catholic School. Therefore, all families are required to participate in Schoo wide events, programs, and fundraisers. Option 1 - Single Payment Plan: Under this plan, the entire amount of tuition is paid directly to the school on or before June 30, 2018. Tuition paid in full by this date will receive a $100.00 discount per family. Option 2 - Mandatory FACTS Tuition Plan: Under this plan, payments will be automatically transferred from your bank account monthly beginning in July. Parents have the option of a 5th, 10th, 20th, or 25th of the month transfer. All tuition accounts must be current at the end of each quarter in order for your child/children to continue attending school. Readmission to Our Lady of Mercy School will be granted only to those whose account is paid in full. Option 3 - The annual amount of tuition can be paid directly to the school in 2 or 4 equal installments as approved by the school's Administration. Our Lady of Mercy Catholic School will assess an Administrative Fee of $100.00 when choosing this option. IMPORTANT NOTE: Accounts need to be current at all times. A $50 monthly fee will be charged to accounts that are not paid up up on a timely basis until the account becomes current. This fee will be added to the annual tuition rate or the balance owing regardless of what option is chosen. FACTS charges $43.00 per year for their services; this fee is added to the annual tuition cost. FACTS will also charge for missed payments, insufficient funds or closed accounts. Tuition payments must be paid by the mutually agreed upon assigned dates. FACTS reports delinquent accounts directly to the School's Administration. The School then forwards that delinquent account to a professional third party collection agency, which takes over collection of this legal debt. This action can directly impact eligibility to re-enroll at Our Lady of Mercy Catholic School. Non-payment of tuition will jeopardize a student's ongoing placement in the School. If tuition is not paid in a timely manner of payment is ignored, students will not be permitted to attend school until the account is cleared at the end of each semester. Student Registration for the upcoming school year is extended to families who are financially up-to-date with the current school year's tuition and applicable fees. The annual registration fee levied for each student being enrolled is non-refundable. This fee ensures a student's placement and supports program costs that include but not limited to: clerical costs for student files, certain curriculum materials and books, student insurance, standardized testing materials, and family PTO dues. The (non-refundable) Student Registration Fee for 2017-2018 is $450.00 per students. Family/Student Registration is recognized as complete when required forms are submitted, the new registration fee is paid in full, and the current school year's tuition is paid in full. Formal School Tours for new families/new students are given Mondays thru Thursdays at 9:15 a.m. Interested Families of entering Kindergarten students, as well as Grades 1- 8, just need to check into the School Office at 9:00am. Families in need of tuition assistance may request forms from the principal in February and apply for financial aid through the Archdiocesan Scholarship Fund (processed through TADS) and The BASIC Fund. Our Lady of Mercy Catholic School requires each School family to be active members of the School community. Each family is expected to meet a specified number of Service Points within the school year: 50 points for a 2-parent household and 25 points for a single parent household. Points are allotted for each approved donation, volunteer activity, or leadership role undertaken within the School’s yearly calendar and for the events sanctioned by the Administration. The PTO Executive Board collaborates with the Administration and Staff to identify and organize the activities and opportunities for families to meet their participation obligation. Parent Participation acknowledges and respects that tuition does not cover the full and true cost of a child’s education at Our Lady of Mercy Catholic School. Fundraisers provide the opportunity to fill in the gap between tuition and actual cost. So it follows that all families are required to participate in the School’s fundraising programs, including TWO mandatory fundraisers as jointly determined by the Parent Teacher Organization and the administration. Unpaid mandatory fundraising costs and other fees will automatically be charged to the families’ FACTS accounts. Families not meeting the service point requirements by May 31st. 2018 will be assessed a flat fee of $750.